The family Apidae is a large and very diverse group of bees. 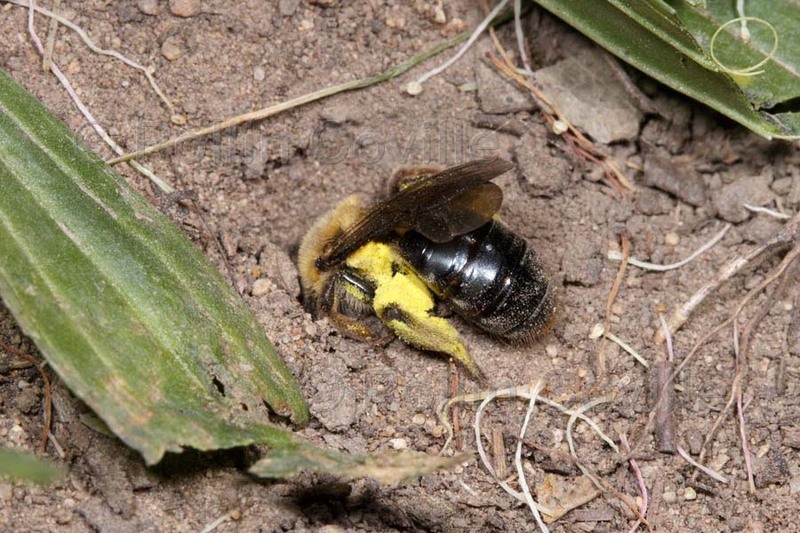 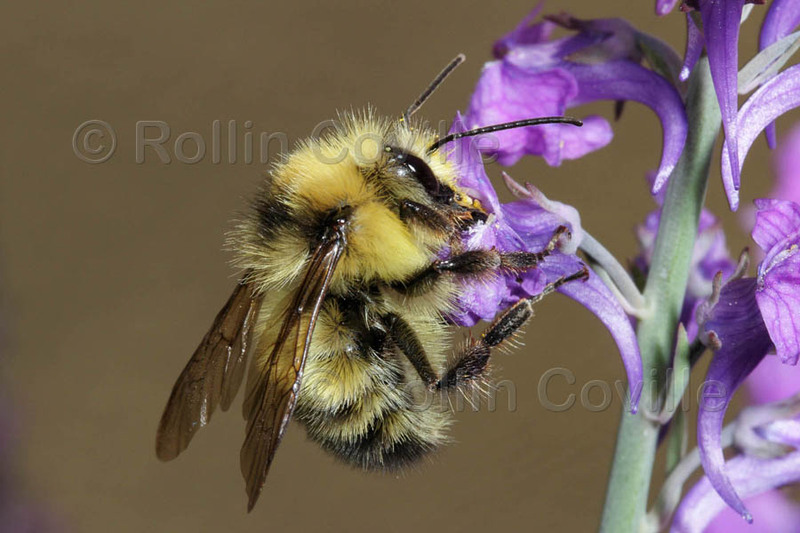 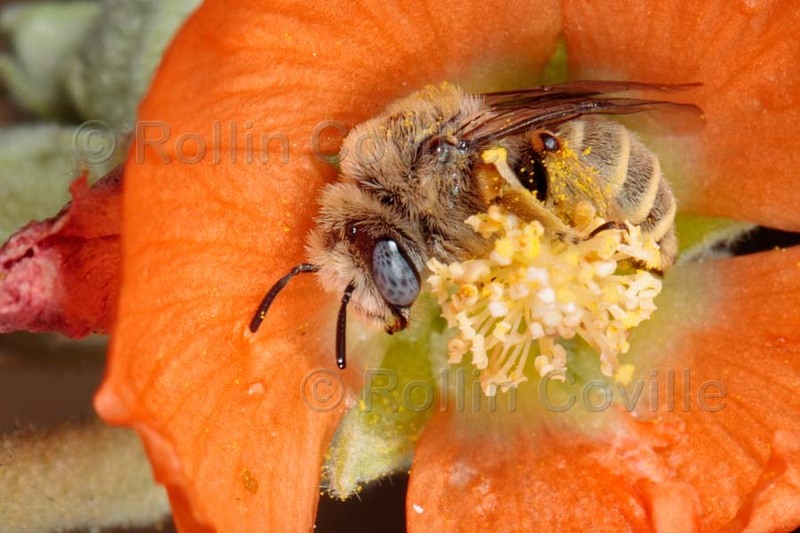 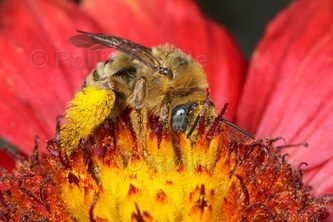 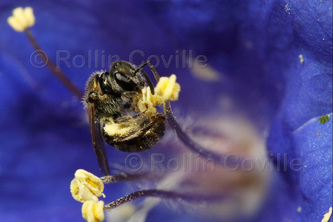 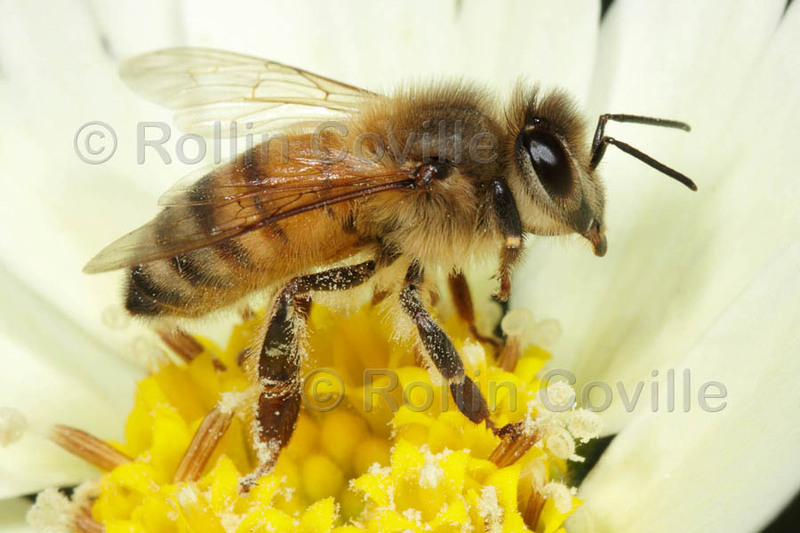 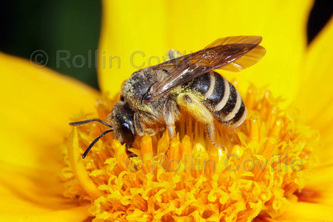 It contains a diverse array of digger bees, most of which nest in the soil, carpenter bees which nest in soft wood or pithy stems, and bumble and honey bees which nest in large cavities or hives, are social, and have distinctive pollen baskets (corbicula). 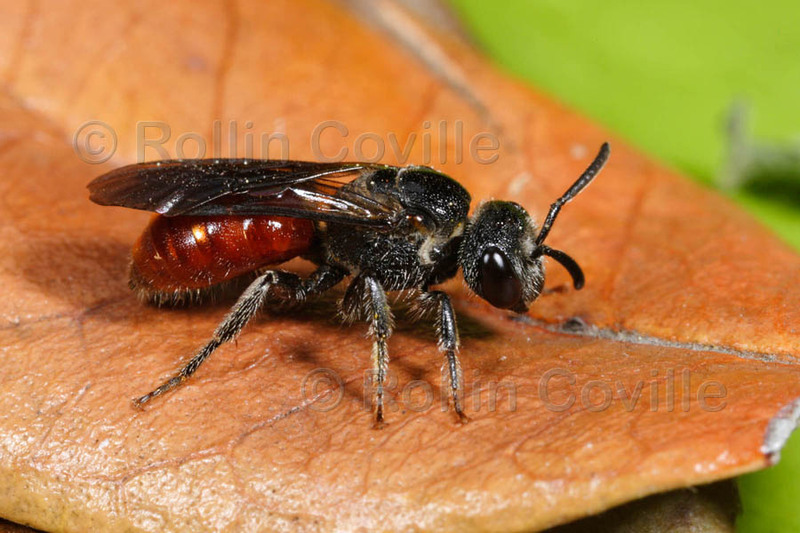 It also contains many wasp-like bees that make their living at the expense of other bees by invading and parasitizing their brood nests (see Cuckoo Bees). Many of the bees in this family are large, rather chunky and stout in shape, but there are always exceptions, like Ceratina, which are very small and slender. 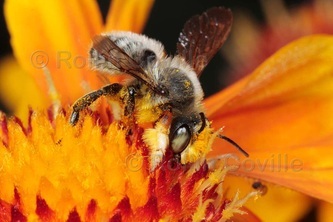 Some of the genera within this family include: Apis, Bombus, Diadasia, Melissodes, Svastra, Eucera, Peponapis, Anthophora, Habropoda, Xylocopa, Ceratina. 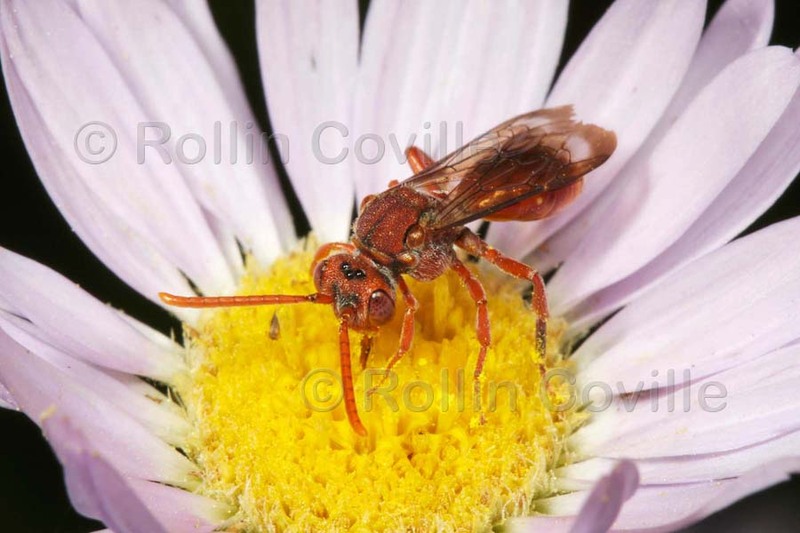 Cuckoo genera within the family include Nomada, and Triepeolus (see Cuckoo Bees). Additional rare genera include Centris, Exomalopsis, Epeolus (rare cuckoo genera). 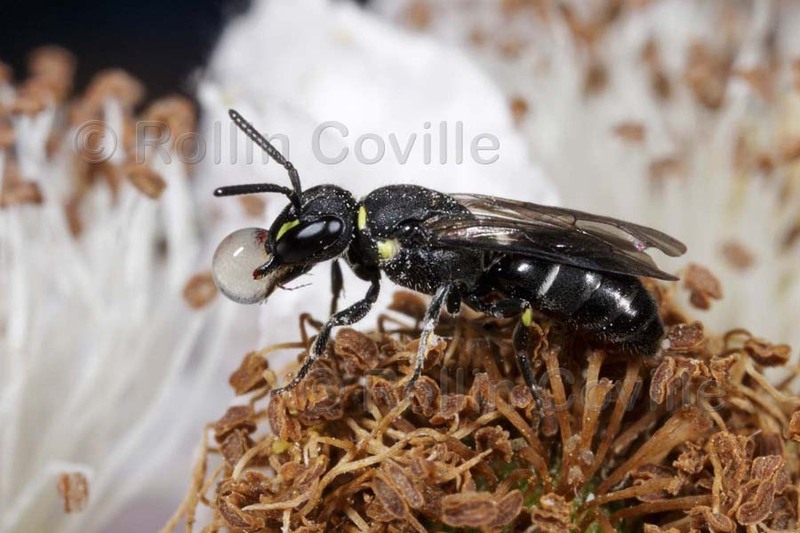 The small family Colletidae is known for the membranous, cellophane-like secretions used by females to line burrows they excavate in the soil, or that they construct in tubular cavities. 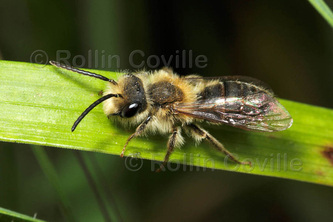 Most of these bees are medium to tiny, and slender in form. 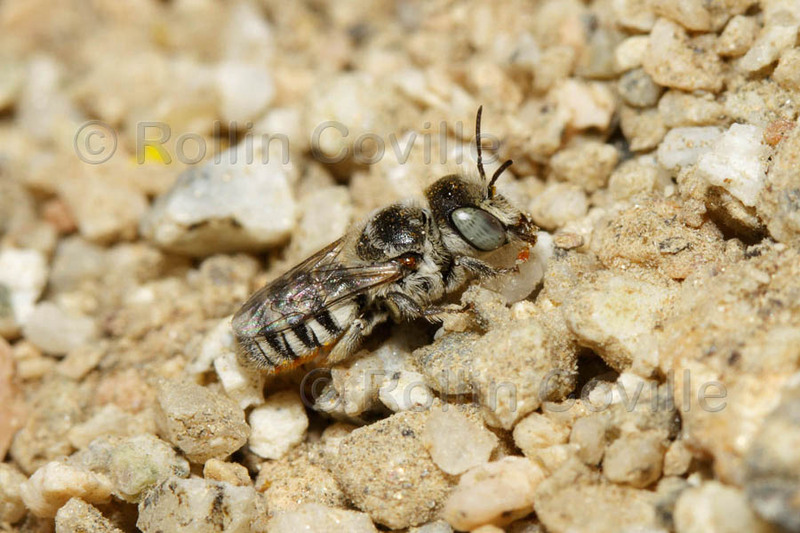 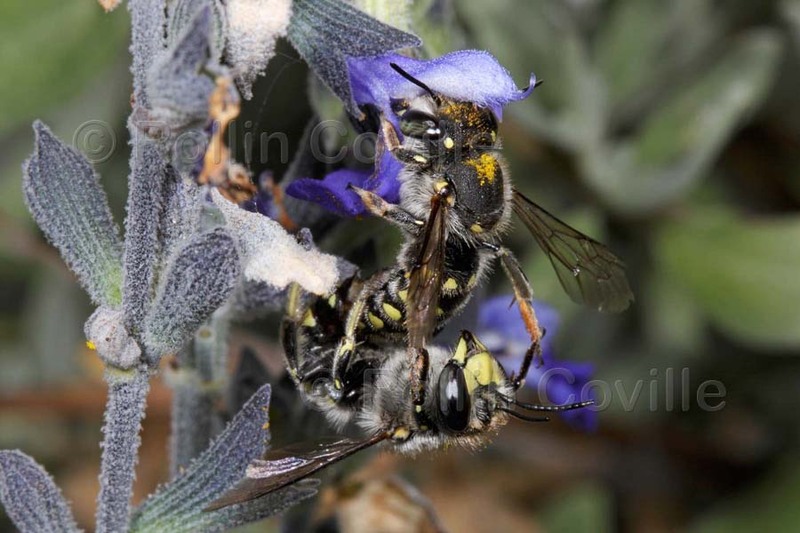 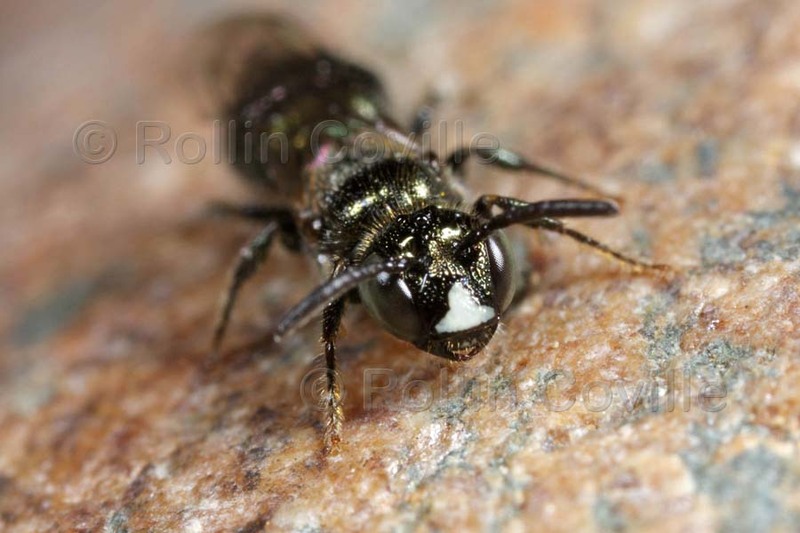 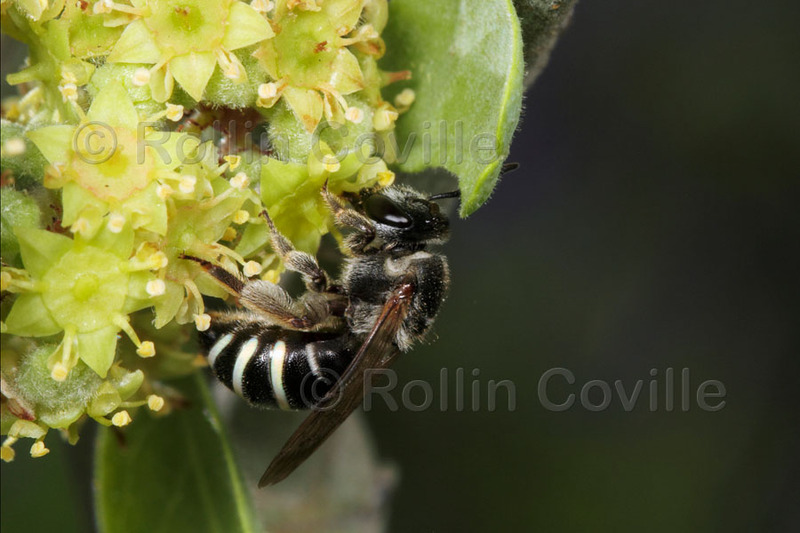 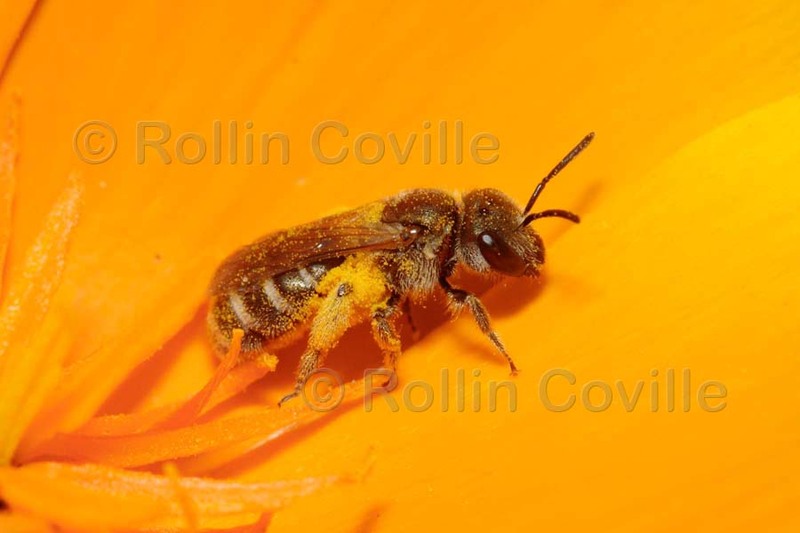 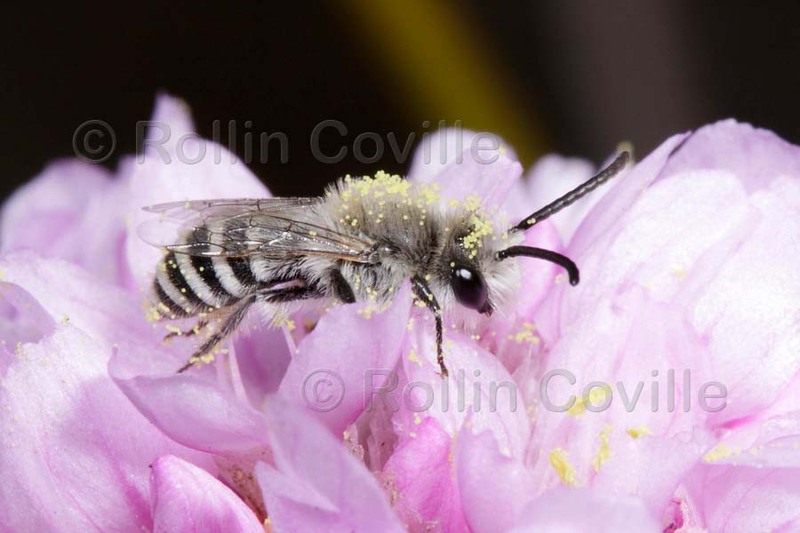 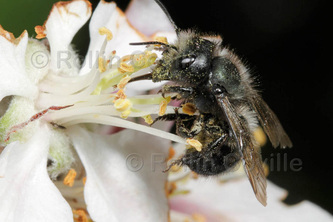 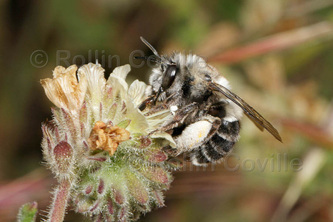 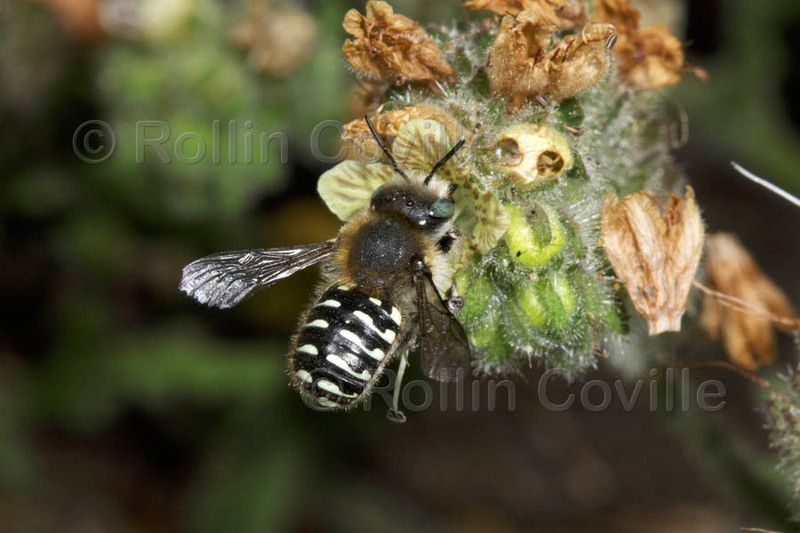 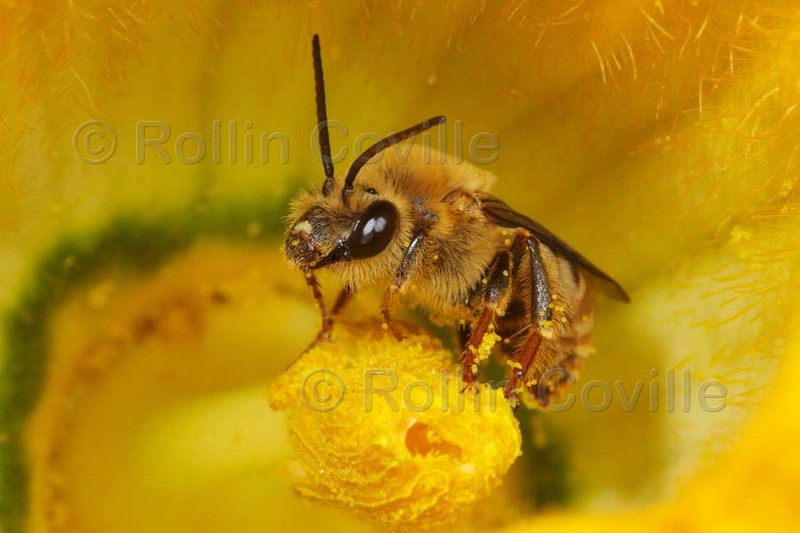 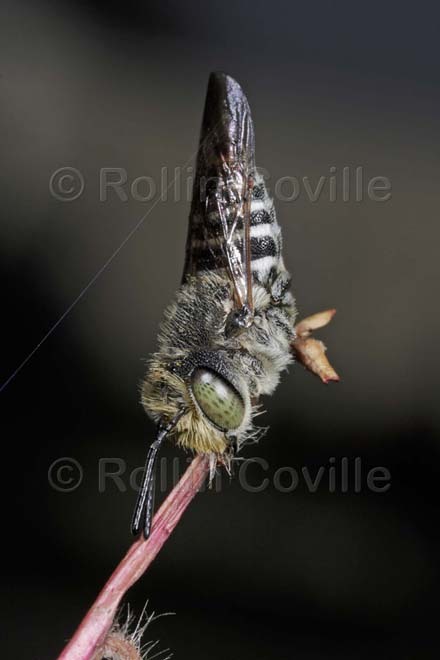 California has two very different-looking genera from this family: the larger, fuzzy bees of the genus Colletes, which have distinctive triangular-shaped faces and often have striped abdomens, and the smaller black, relatively hairless bees of the genus Hylaeus that usually have yellow facial markings, giving them a "masked" appearance. 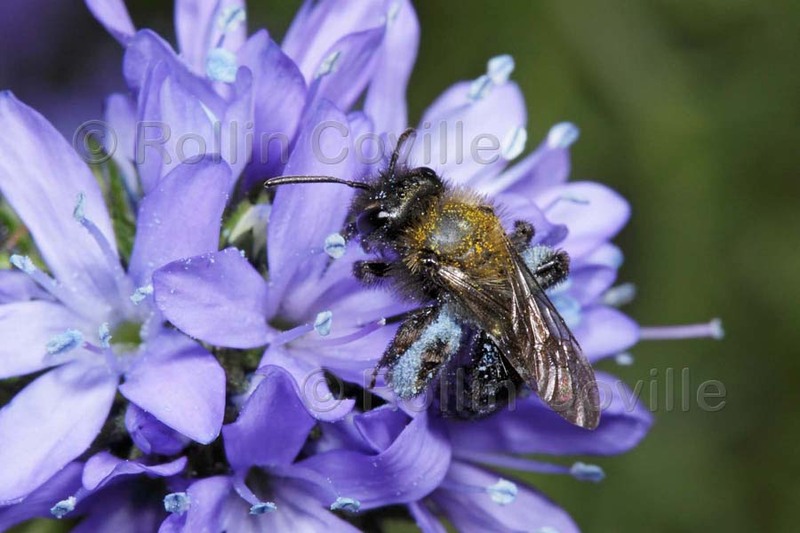 This is a large family of soil nesting bees, hence the common name Mining Bees. 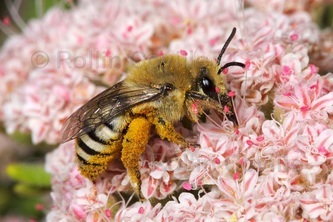 These are among the first bees to emerge and visit flowers in spring. Most are medium to tiny, and slender in form. There are two very different-looking groups within the family, but only the genus Andrena is widespread and common at our urban garden sites. Additional, but uncommon, genera include Calliopsis, Panurginus, and Perdita. Sweat bees have earned their common name from the tendency, especially of the smaller species, to alight on ones skin and lap up perspiration for both its moisture and salt content. 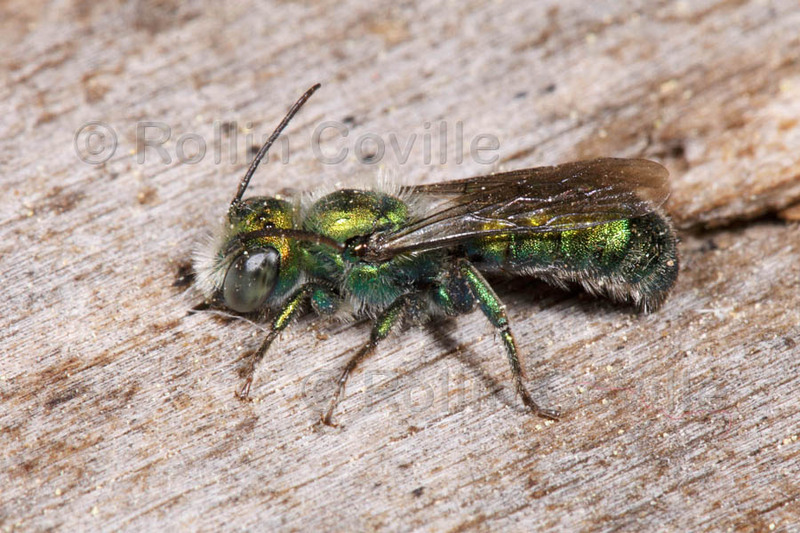 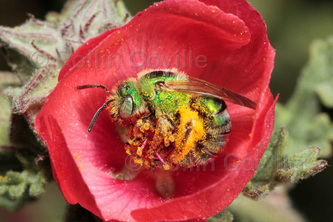 These bees are rather nondescript in their general appearance and structure, but there are a few very striking species, like the “Ultra Green Sweat Bee,” whose shiny metallic sheen appears like a jewel among the garden flowers. 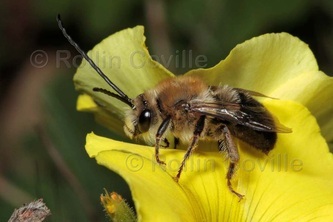 Many are medium to tiny, and slender in form, much like Colletes and Andrena in the two preceding families. 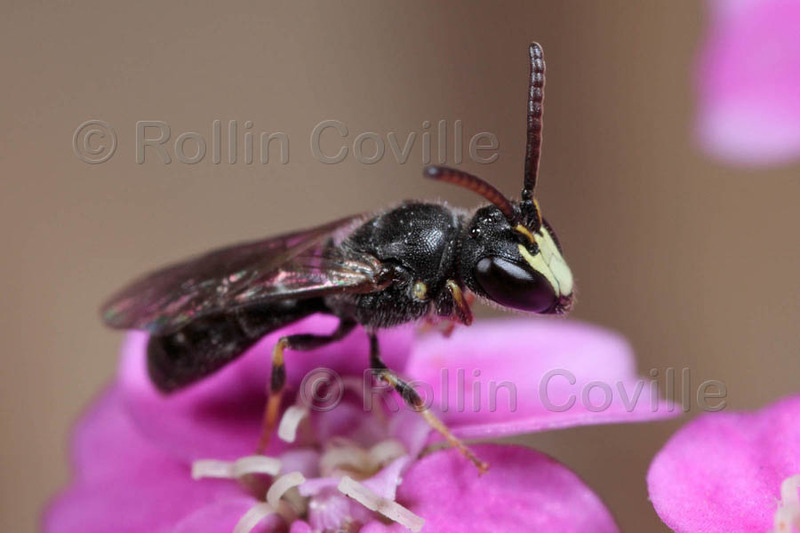 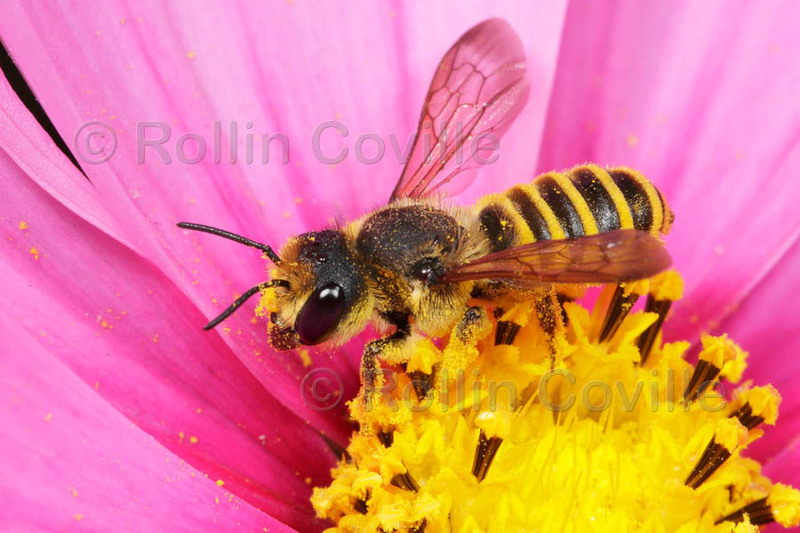 Some of the most common genera include: Agapostemon, Halictus, and Lasioglossum. Cuckoo genera include Sphecodes. 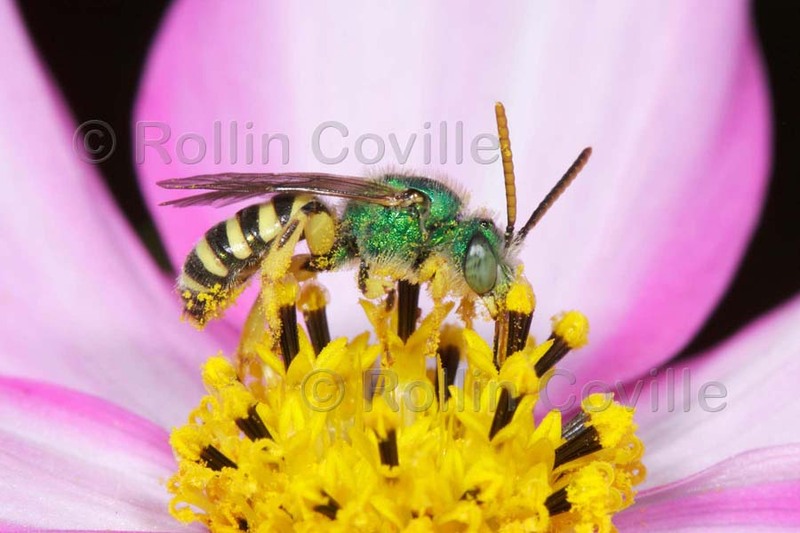 Additional rare genera include Augochlorella, Conanthalictus, Dufourea, Dieunomia, and Nomia. 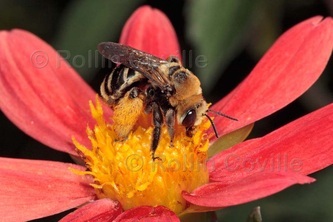 The family Megachilidae is a large and diverse group of bees. They are the architects of the bee world. They nest primarily in pre-formed tubular cavities (tunnels of woodboring beetles, hollow plant stems, and even abandoned snail shells) using a wide variety of materials collected from the environment, including leaf and flower pieces, masticated leaves, mud, resin, plant hairs, and pebbles to construct brood chambers for their young. 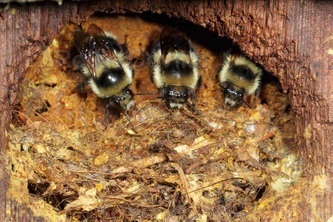 Bees of this family may be assigned to different architectural guilds based on the kind or combination of materials they use to construct their nests, for example, leaf-cutting, mason, resin, or wool carder bees. One striking difference with the bees in this family is that most female Megachilidae transport pollen in scopae on the underside of their abdomens, except for the few that have adopted the cuckoo lifestyle and lack scopae all together. 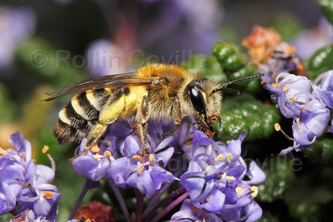 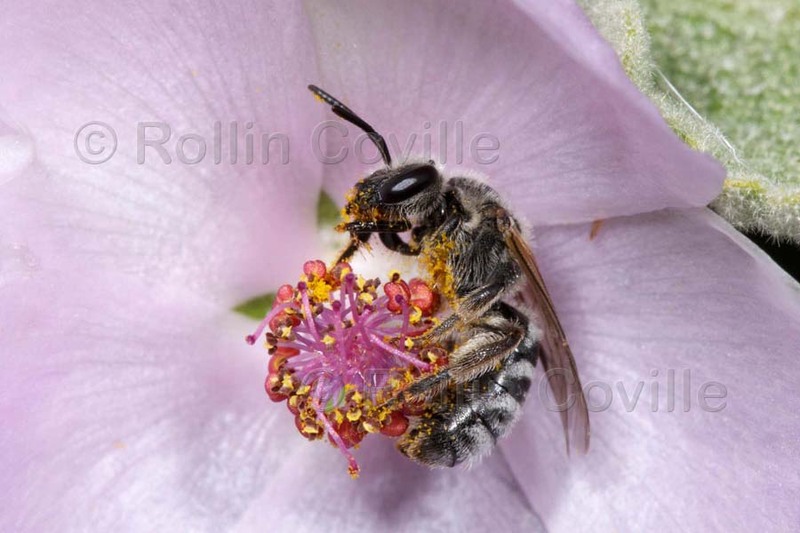 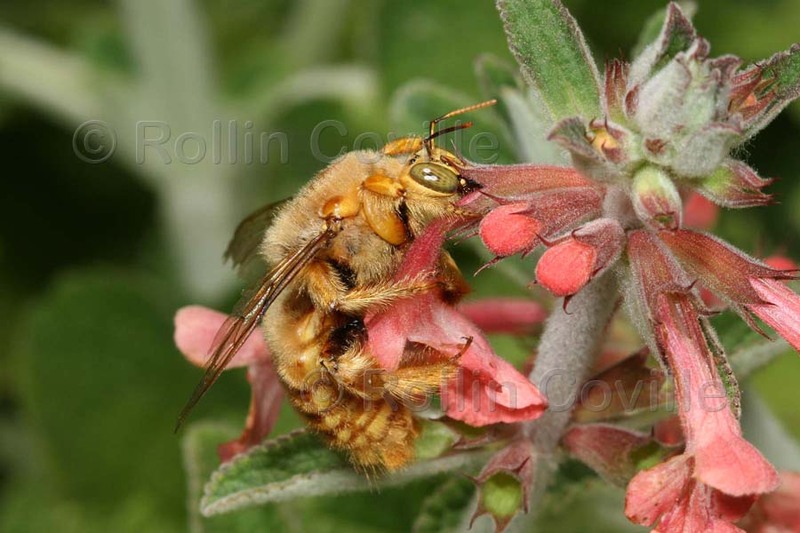 The most common genera that you will find in your gardens include: Anthidium, Ashmeadiella, Hoplitis, Osmia, and Megachile. 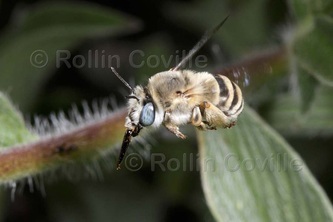 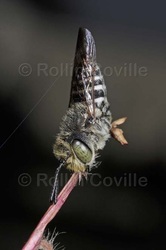 Cuckoo genera include Coelioxys. 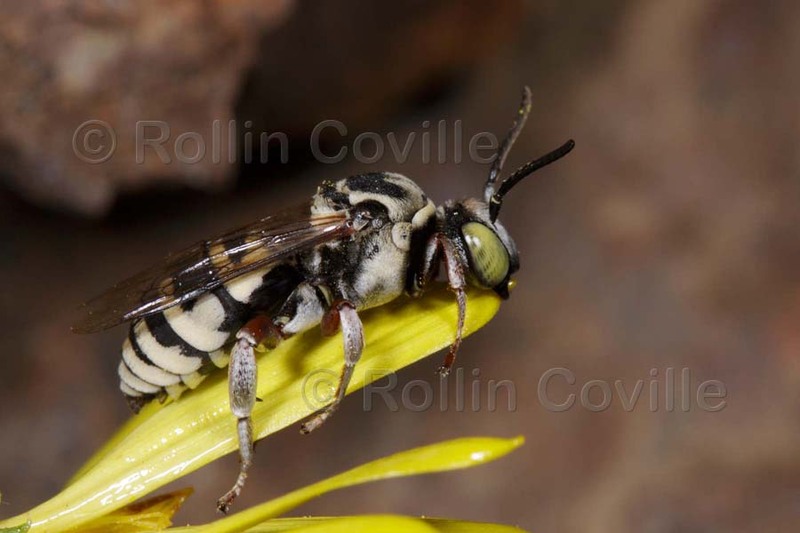 Additional rare genera include Lithurgus, Anthidiellum, Dianthidium, Chelostoma, Heriades, Protosmia, and the cuckoo genus Stelis.